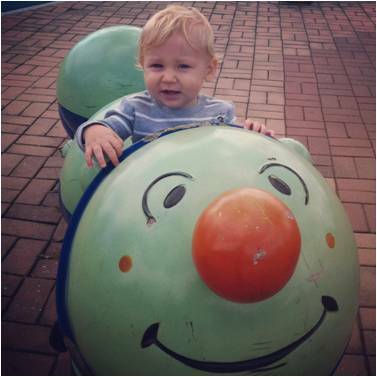 HomeEXPAT LIFEAdventures in Parenting Abroad Pt. 4: Please Please Please Reproduce! We’ll Give You Anything You Want! Adventures in Parenting Abroad Pt. 4: Please Please Please Reproduce! We’ll Give You Anything You Want! Welcome to the final installment of this series! As I’ve mentioned in previous installments, here, here, and here, having a baby in Korea, just like anywhere else, is an adventure. And just like everywhere else in the world, there are upsides and downsides. One huge upside, in my opinion, is the effort that goes into celebrating children and accommodating mothers of young children. 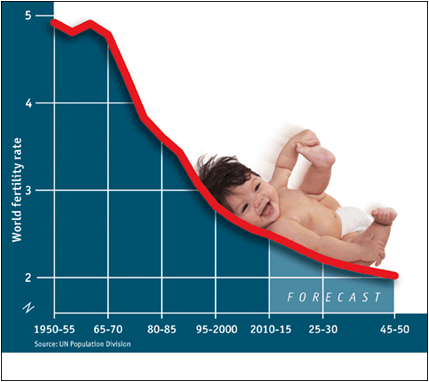 Birthrates are declining worldwide and Korea is leading the trend. 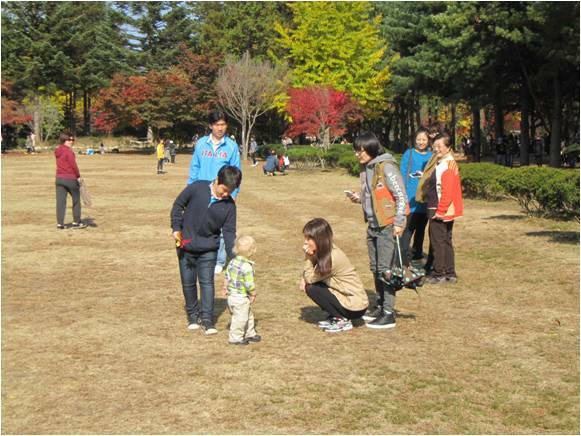 South Korea’s crude birthrate is currently 8.42 a year per 1,000 persons. This puts South Korea among the countries with the lowest birthrates in the world and is well below replacement fertility levels. A lot has been written about the reasons and the implications of these sustained low fertility levels. Here is an interesting paper by Elizabeth Hervey Stephen, Ph.D. from the Korea Economic Institute. Delayed marriage and delayed childbirth is a concern for many Asian countries, not just South Korea. (Here’s a good read about that from an issue of the Economist.) Inarguably, Korea is going to have to take a long hard look at the traditional roles of men and women, and how these hurt or help, as it creates social policy aimed at increasing fertility rates. One does not need to look very far to see why many Korean women are delaying or completely forgoing motherhood, but in the absence of public policy that really gets to the heart of the low birthrate issue there are some amenities for parents of young children to be taken advantage of. Just another day being surrounded, admired, and photographed. For one, babies are truly enjoyed and celebrated. In September we had a friend visiting from the US and she was flabbergasted by all the attention our little guy received every time we left the house. I can’t speak to how it is in other Western countries, but I can say that in the US people adore their own babies, and their friend’s babies, and the babies in their extended family, but there isn’t much interest in babies in general. Sure, every now and again an older woman will approach to ask how old or to tell you how fast the time flies, but it is nothing like here. 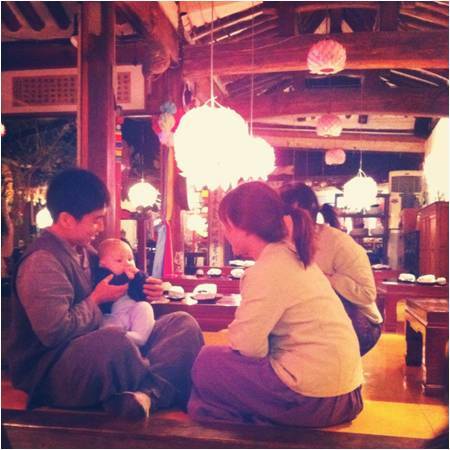 In Seoul, it seems that everyone loves babies. Young women, older women, teenage boys and girls, older men, businessmen, little boys and girls, they all go gaga over babies. And, let’s be honest, nothing warms a mother’s heart more than having others marvel over the undeniable beauty of the fruit of her loins. Another great perk? Public nursing rooms. These rooms range from simple to extravagant but they are all clean and equipped with, at the very least, a comfortable place to sit to feed baby, a real changing table (not one of those plastic pull-down things), and hot and cold water. These rooms exist everywhere from commuter trains to museums to department stores, to grocery stores, to airports, to subway stations. The ones at the big department stores like Shinsegae and Lotte are so nice that I have, on more than one occasion, been tempted to spend the whole day there. These ones have private dimly-lit nursing areas with nursing pillows, large sinks to wash baby if necessary, beautifully appointed changing tables, high chairs, and separate rooms with cribs in case baby needs to take a nap. Many of these baby care rooms also have wipes and soap and even a table to measure and weigh baby. 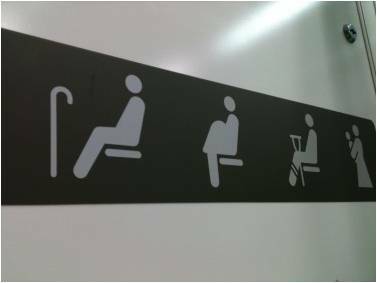 Seats for the elderly, the pregnant, and injured, and those with babes in arms. If you don’t have a baby you may not understand how amazing it is to have these things available. 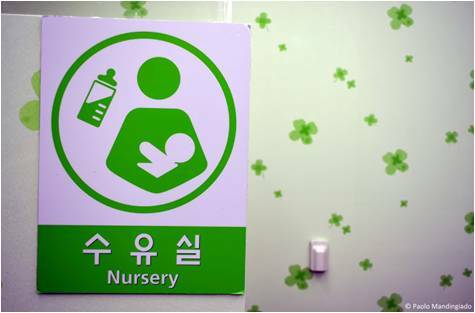 And if you’re from a country like the US, for example, where baby care rooms and nursing rooms, if they exist at all likely double as broom closets, you may have a hard time believing that these magical places are real. I assure you, they are. (I swear I heard the Hallelujah Chorus the first time I stepped into the nursery at the Myeongdong Shinsegae.) Venturing out into the city with a young baby who will invariably need to be changed, fed, or to nap within two hours or less of you leaving your home is enough to make many parents just resign themselves to living indoors. Knowing that these facilities are readily available all over the place makes joining the land of the living so much easier. Seoul has a lot to offer and I really appreciate how much effort is put into making it easier for mothers to tote their children around as they enjoy the city. At one of the many nearby playgrounds. And speaking of toting your children around, the public transportation system in Seoul is on board. There are designated seating areas on subways and buses for people with small children. I can only count one time that I was not immediately ushered into a seat while on a train or bus with my baby, and in the defense of everyone on that train, they were all over 65 and were heading back to Seoul after a day of hiking. I give them a pass. They made up for it by cooing over little baby boy, feeding him delicious Korean treats, and even holding him on their lap to give my back a break. There are plentiful public playgrounds all over the city. I can count 8 within a 10-minute walking distance of our apartment. They are often tucked into any available space and outfitted with squishy bounce-friendly floors and interesting apparatus. There are also play rooms available in many department stores and shopping areas. Parents can sit and drink a coffee while their children play in a clean and secure environment under the watchful eye of attendants. Add to this the various free programs available at many gu offices that include story times and music lesson and kids’ libraries with quiet reading and play areas, several free children’s museums, and readily available stroller rental at many stores and parks. These are just some of the many things available to parents and their small children. I asked a Korean mother I know if all these amenities really were an effort to get women to have more children. 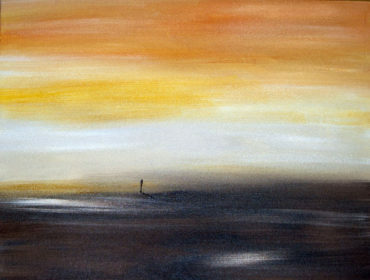 She said that she thought they were a way of saying “thank you” to the women who had taken the plunge. 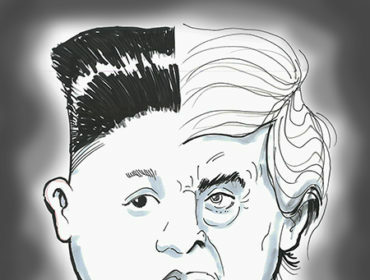 Koreans value children. This much is true. These efforts to accommodate small children could be nothing more than an expression of that value, but I do think they are meant to make it as easy as possible for women to make the choice to have children. Unfortunately, much deeper and more far-reaching changes will have to be made in terms of gender equality and societal expectations to really make a difference in Korea’s fertility rates. In the meantime, these perks can’t hurt, and I appreciate them very much indeed. Out and about, feeling accommodated and enjoying Seoul after a quick stop for a diaper change at the nursery in Samgakji Station. 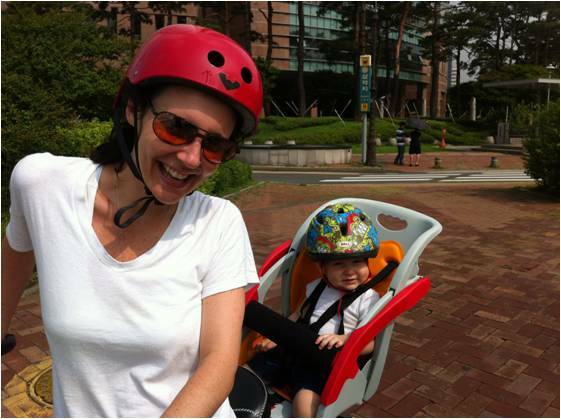 Ms. V lives in Seoul, South Korea with her spouse, their son, and three ferocious felines. She is a yoga teacher and a co-founder of Samdhana-Karana Yoga: A Healing Arts Center, a non-profit yoga studio in Tacoma, WA. While not marveling at her beautiful baby or doing yoga, she enjoys, writing, reading, and has dreams of one day sleeping again. Ms. V keeps in touch with her students back in the States via the blog Body, Mind, Seoul and with perfect strangers via the blog I Don’t Know, where she ponders everything she doesn’t have an answer to – so a lot! She is also a contributing writer for World Moms Blog.